What's Old Can Be Brand New Again. Originally posted at one my sister sites, Simple.Organized.Life. Almost immediately, my friend replied with “Wow – I remember those toys from when we were kids! Yes, bring them on over!” And so I did – and proceeded to play Santa for a day while giving these kids a giant box of “new to them” toys. They had so much fun taking out all these “new” toys, giving each one a once or twice over, and then proceeding to choose favorites. When we went to dinner, they had to bring a new toy with them. When we went to the movie in the park that night, they had to bring a few with them. This was an exciting day – tons of new toys on a random day that wasn’t their birthday or Christmas! To them, these were new items, while to my friend and I they were a grand memory from 30+ years ago. Solidly built and protected from the elements, they didn’t look too worse for the wear at all, and these kids will get years of entertainment out of all this stuff. And it was all free! My friend even told me he will keep them for when (if) I ever have kids, so hopefully they will get another use again someday down the road. It felt really good to see toys from so long ago being played with as if they had just been taken out of the boxes that morning – it just goes to show you that kids can be VERY happy with almost anything you give them, and they don’t need the latest and greatest new cheaply made toy every other week that will probably break within the year! Money Management Advice From My 9 Year Old. My son loves playing with some of my husband’s old toys. It really is a money saver! We go one step further. We “recycle” our kids’ toys. They have so many toys that they cannot play with all of them at the same time. (Most of these toys are gifts.) Some of the toys get lost now and then. When we find them again, our boys are very happy and treat them as new. Along with the “what is old can be new again” theme, I have a good one–Mom’s recipes! So many times when I am eating in a restaurant, or watching the Food Channel, they come out with a supoosed “new” dish that at times is a mirror image of something my mother used to cook. So shortly thereafter, good ol’ Mom gets an email or a phone call asking her to dig up a recipe from 30 or so years ago. What we usually end up with is a great meal, partnered with some great conversation of childhood memories or stories that the dish has conjured up. My mom had saved some of my toys, and my kids got a real kick out of playing with “Dad’s” toys when they were little. I was thrilled when my oldest son insisted on using my old baseball glove for Little League rather than the new one that he got for Christmas. Sometimes the most unexpected things get a second life. First of all, I had ALL of the toys on the left side of the picture. 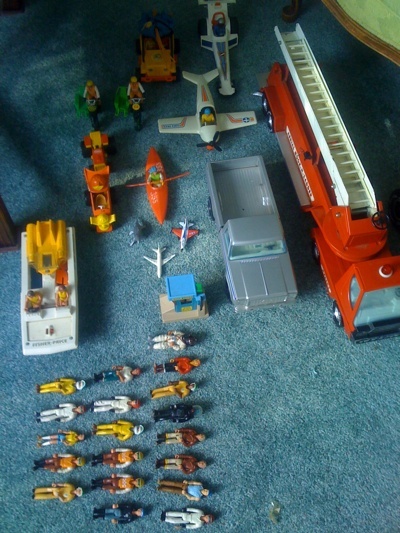 Second, my mom broke out some of the old Fischer Price toys in our attic when we took our oldest on her 1st plane ride. She LOVED them!